Phyllostachys aureosulcata aureocaulis is commonly known as Golden Crook-stem, Yellow Groove Bamboo, Yellow Grove, and Golden Grove bamboo. So if I call this species by different commonly used names throughout this page, don't be surprised, it's because Phyllostachys aureosulcata f. aureocaulis seems to have different common names across the world! 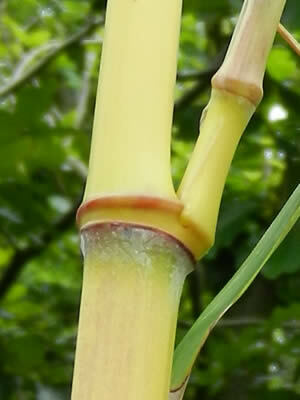 The term Crookstem is a good common name for this bamboo as some of the culms can grow in a crooked zigzag fashion, and they are indeed golden in colour. The golden culms certainly stand out in any garden setting and the plants can have an impressive impact if standing alone and kept tidy at maturity to best show off the distinctive yellow culms. Yellow Groove or Golden Crook-stem? A clumping species with moderate spreading habits and can be used on its own as a specimen plant, as hedging, or for a grove. Over 10 years from 1 m. to 3 m (4-10 ft.). Maximum height: 4-7 metres (13-24 ft.) but won't grow to maximum height in pots. Maximum diameter: 4 cm (1.6 inches). Taller culms usually mean wider diameter culms. 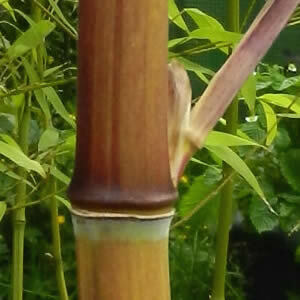 Image: Golden Crook-stem showing zigzag in a new culm of a container grown bamboo. 3cm wide. Large colourful shoots grow upwards but sometimes seem to just change direction from the node, followed by growing upwards from the next node, or even changing direction again. 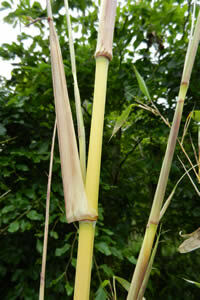 It is this erratic growth of some of the culms that causes the zig-zagging of the culms. The first time I saw a large shoot do this I thought it was broken! Looking out of the window I saw it heading sideward and thought it had been damaged. Only to find the very next day it was growing upwards again. Yet another interesting bamboo plant that provides something different to look at every day! Phyllostachys aureosulcata aureocaulis sheaths are shed from the culm as the new branches push their way out, and similarly the sheaths from secondary branches drop off as new growth unfolds. You can see this range of culm colour in the pictures on this page. All these images were taken of the same plant over the course of a couple of weeks. 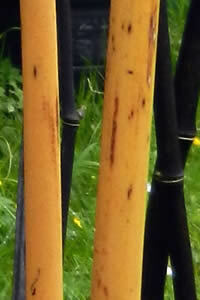 As said earlier, the culms of Phyllostachys aureosulcata f. aureocaulis are a stunning golden colour. However, they can have a beautiful red tint when the culms are young, standing out in contrast to the cream colour of new culms. Sometimes this colour variation of reds to oranges will remain to a certain extent if Phyllostachys aureosulcata aureocaulis gets plenty of sun but the paler creamy yellow of new culms will develop into a deep gold as the culms mature. 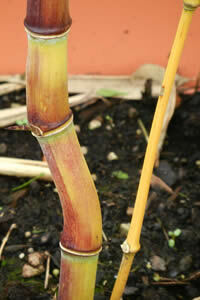 Image Left: Yellow bamboo culm with sheath dropping and new branch emerging. Image Right: Red and orange tints on lower part of new Phyllostachys aureosulcata aureocaulis culm. Two branches emerge from each of the nodes. Leaves are green usually but occasionally have a very thin stripe on them. Hardy to min. -26°C (-15°F), zone 5. Although I think I'd prefer to keep it above -18°C to be on the safe side. Full sun and light shade tolerant. Image: New shoot next to old juvenile culm. 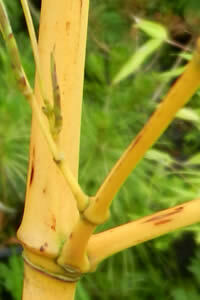 This is a bamboo that goes really well against darker backgrounds to show off the bright golden colour of culms. It is more impressive if standing alone and not cluttered by other plants. 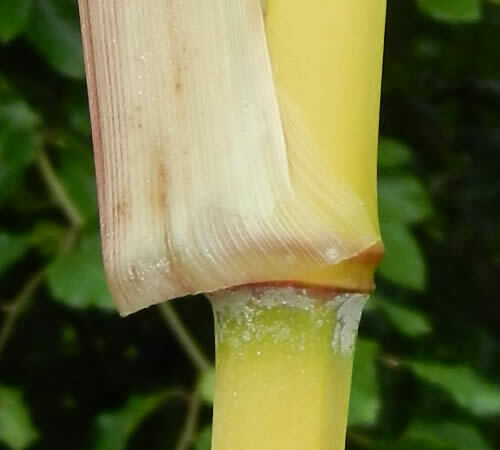 The yellow, and sometimes zig zagged, culms will brighten up any garden or landscaping project and Phyllostachys aureosulcata aureocaulis can be used for a focal point. Can be kept in a container if large enough not to be detrimental to the health of the bamboo, and provided a yearly check on whether it needs re-potting or not is carried out. If it outgrows the container you can divide the bamboo and get two plants or more. 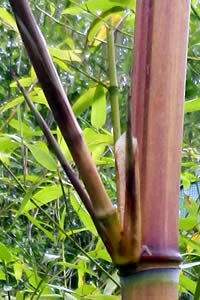 I've been searching the web for examples of this bamboo under the various common names it appears to go under. However, I've found images from a large nursery in the US that show it as having green culms, not yellow! Whether that is a different bamboo altogether or not I am not sure but how can a plant be described as being 'yellow' but have completely green culms in pictures? I'll leave you with that one as a not so descriptive common name.